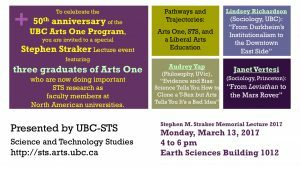 This year, in order to kick off the celebrations of the fiftieth anniversary of the UBC Arts One Program, Science and Technology Studies (STS) at UBC has a special Stephen Straker Lecture event featuring three graduates of Arts One who are now doing important STS research as faculty members at North American universities. Stephen Straker was a historian of science, a faculty member in Arts One, and an inspiration for the Science and Technology Studies program at UBC. The event will feature brief research talks and a panel discussion.